God can take your past and seemingly insignificant seasons of your life and turn them into your destiny. That’s just what happened to James Brown. From athlete to multi-sport commentator, he recognizes how God has promoted him to be an influence through his passions. James and his wife, Dorothy, share their powerful story in an interview with Andrew. Listen to the Browns’ testimony and gain an understanding of real-life redemption and how to win in every season of life. 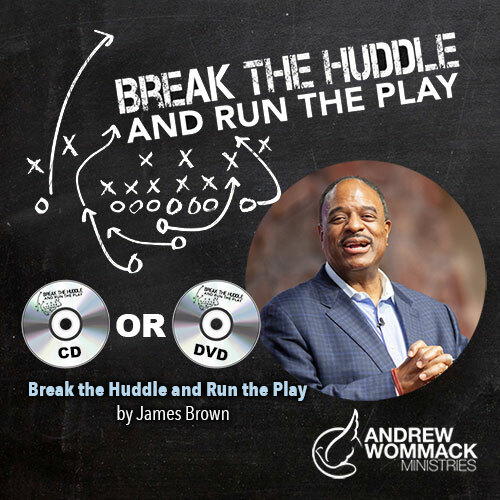 Also, be encouraged by James’s special teaching, “Break the Huddle and Run the Play.” This biblically sound message uses a football analogy to illustrate the truth that faith without works is dead. When we get instruction from our Coach, we need to move past just talking and step into action. From athlete to multi-sport commentator, he recognizes how God has promoted him to be an influence through his passions. James and his wife, Dorothy, share their powerful story in an interview with Andrew.